To subscribe or unsubscribe, email info@PathologyOutlines.com, indicating subscribe or unsubscribe to Case of the Week.� We do not sell, share or use your email address for any other purpose.� We also have emails for new Pathologist jobs (biweekly), new Laboratory (not pathologist) jobs (biweekly), website news (monthly), new books (monthly), and a newsletter (twice a year).� You must subscribe or unsubscribe separately to these email lists. We recently updated the section on lipomatous tumors in the Soft Tissue chapter.� We added more content from textbooks, journals, the AFIP fascicle and the WHO tumor book, as well as images from the AFIP fascicle and elsewhere.� We emphasize references to journals with free full text, which are highlighted in green.� Let us know what you think. Share your tips on using PathologyOutlines.com by entering our Contest (click on the Contests button on the Home Page) to win a $50 Amazon.com gift card. 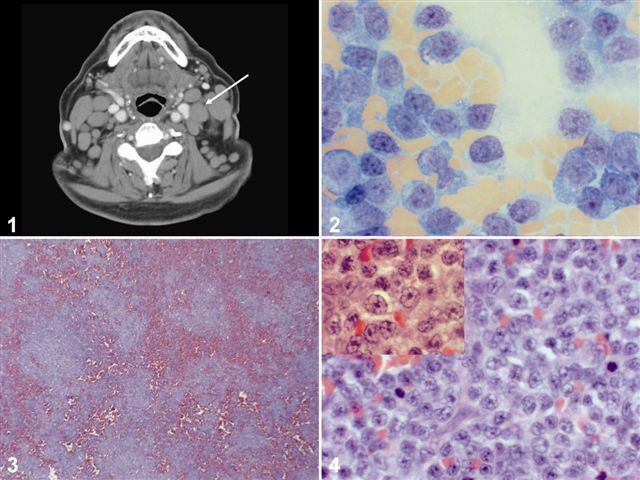 Three years ago, a 69 year old man was found to have leukocytosis and lymphocytosis on a routine visit. �He had no constitutional symptoms or weight loss.� Physical examination was normal, with no lymphadenopathy or hepatosplenomegaly. �His white blood count was 18.2 K/�L (normal 4-11) with 46% neutrophils (normal 50-70%); 44% lymphocytes (18-42%); 3% monocytes (2-11%); 1% eosinophils (0-4%) and 0.5% basophils (0-2%).� The platelet count was 401K/�L (150-440). The lymphocytes were immunoreactive for CD20 and CD79a. The Ki-67 fraction was overall 10-20%. Flow cytometry of the nodal tissue showed coexpression of CD19, CD20, CD5, CD23 (bright), and HLA-DR. �There was no expression of FMC-7, CD10 or bcl-1.� No cytogenetic studies were available. The paraimmunoblastic variant of SLL/CLL is a rare morphologic variant characterized by a diffuse to nodular proliferation of paraimmunoblasts, the cells usually seen in pseudoproliferation centers of SLL.� In classic SLL, the predominant population is small lymphocytes with scant cytoplasm, coarsely clumped chromatin and inconspicuous nucleoli.� In the paraimmunoblastic variant, the predominant cells are slightly larger, with moderately abundant cytoplasm, more open/vesicular chromatin and a single prominent, central nucleolus.� The paraimmunoblasts have the same staining pattern as classic CLL/SLL (i.e. expression of CD19, CD20, CD5 and CD23, negative for CD10 and FMC7).� It is considered the tissue counterpart of a prolymphocytic transformation of CLL. The paraimmunoblastic variant was first described by Pugh as an aggressive variant that presents with generalized lymphadenopathy, and occasionally splenomegaly (Am J Surg Pathol 1988;12:907).� The term �paraimmunoblast� was first used by Lennert (Malignant Lymphomas other than Hodgkin�s disease. Berlin/Heidelberg: Springer-Verlag, 1978:111-36) to describe a mitotically active, medium-sized cell with weakly staining eosinophilic cytoplasm, irregular nuclear borders, vesicular chromatin and a single, prominent, central nucleolus.� In contrast, immunoblasts are larger cells with moderate basophilic cytoplasm, large round nuclei and a similar prominent, central nucleolus.� Centroblasts are larger cells with multiple basophilic, peripherally-placed nucleoli. Blastoid variant of mantle cell lymphoma also has a vaguely nodular architecture and slightly larger cells with less clumped chromatin. �However, cyclin D1 is overexpressed and t(11;14) is detected by FISH analysis. The original flow cytometric examination demonstrated several features associated with a poor prognosis, including CD38 expression, a complex karyotype and p53 mutation (Jaffe: WHO Classification of Tumors, Pathology and Genetics of Tumours of the Haematopoietic and Lymphoid System, Blood 1998;91:4342, Blood 2001;98:181).� In addition, patients with the paraimmunoblastic variant of CLL/SLL have an aggressive clinical course (Hum Path 2002;33:1145).